To help clarify perceptions and misconceptions about the state of display advertising, Google recently developed a report featuring quantitative information on industry trends. With their Display Business Trends: Publisher Edition report, the company hopes to clear up confusion over the performance and popularity of display ads, as well as demonstrate the growth of the mobile ad display segment. DMNnews.com posted details from the insightful analysis. While traditional 468 x 60 banner ads currently represent only 3 percent of ad impressions, larger ads in sizes such as the medium rectangle, skyscraper, and leaderboard comprise 80 percent of overall impressions. “The trend towards larger sizes is delivering more value for advertisers and increasing value over allocating the same number of pixels to smaller ad formats,” said Jonathan Bellack, Google’s product management director for publisher ad platforms. The report also recognized the enormous momentum behind mobile display advertising. 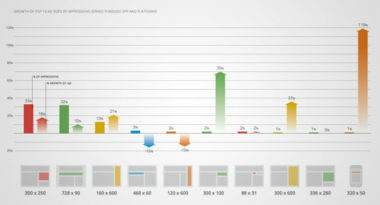 Mobile ad impressions on AdSense and Ad Exchange increased 250 percent over the last half of 2011. Interestingly, the 300 x 50 ad size grew 186 percent last year to become the twenty-first most popular size. In addition, it appeared that almost every publisher vertical experienced double-digit growth in mobile web ad impressions during Q4 2011. The strongest vertical was shopping with 69% growth, followed by food and drink with 61%. The travel vertical was the only exception to such significant growth. Mobile advertising’s booming growth, along with the prevalence of smartphones and tablets, are leading Google to make major investments in that segment. One example is Google’s recent $12.9 billion acquisition of Motorola Mobility Holdings. “It comes down to the opportunity of having richer and more engaging ads,” added Mr. Bellack. To learn how to leverage the power of display advertising in your media strategy, contact MDG Advertising today at , call 561-338-7797, or visit mdgadvertising.com.